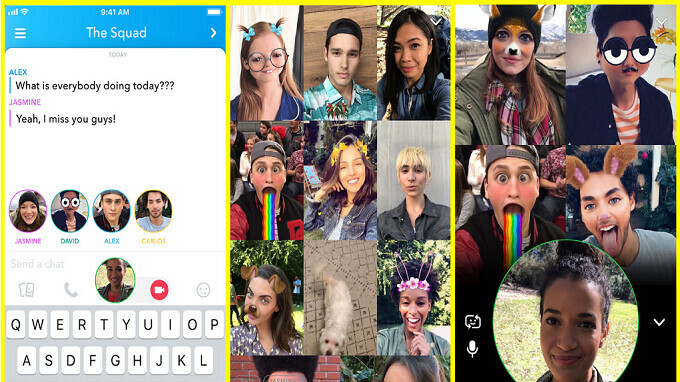 Snapchat has just added a couple of new features to its app and one of them is the Group Video Chat option. With this new feature Snapchat users can now share live videos with as many as 16 family and friends at the same time. For an audio only group chat, you will be able to add as many as 32 members. Making a group video or audio chat is pretty easy and straightforward, first you need to create a new group or open an existing one, then tap on the video icon to start a video group chat or tap on the phone icon for an audio chat. A notification will be sent to all the group members and they can decide to join the video or audio group chat. Another new feature introduced by Snapchat is the support for mention for its stories. So now, anytime a Snapchat user post the name of another Snapchat users in a story, the mentioned user will receive a notification. To mention a user in a story, all you need to do is write the user's Snapchat handle while composing a story and suggestions will appear on the screen, from which you can choose from. The new features are expected to start rolling out to all users soon. And it should be available for everyone globally in the coming weeks.